A regular breeding resident and migrant; late migrants and overwintering birds are uncommon but regular in the winter months, especially in southern Minnesota. The Great Blue Heron was a common species during the Minnesota Breeding Bird Atlas (MNBBA). Widely distributed across southern Canada and the United States, extending south into portions of Mexico; the Great Blue Heron reaches some of its highest breeding densities in eastern North America, especially from the Great Lakes states south to the Gulf coast (Figure 1). Assigned a Continental Concern Score of 8/20 by Partners in Flight and designated a species Not Currently at Risk by the North American Waterbird Conservation Plan. A partial migrant; some populations are nonmigratory, but most northern birds move south, some as far as Central America and northern South America, during the winter months. Small fish, aquatic invertebrates, amphibians, reptiles, small mammals, and birds. A platform nest built of sticks and usually placed in a tree, often 6 to 18 m above the ground. A colonial nesting species. Breeding distribution and relative abundance of the Great Blue Heron in North America based on the federal Breeding Bird Survey, 2011–2015 (Sauer et al. 2017). This majestic bird can be seen throughout the state during the summer season. Nesting colonies may range in number from just a few pairs, which can be difficult to locate, to large, mixed-species colonies that contain hundreds of nesting pairs. Often these are well known to local citizens and biologists alike. When Roberts wrote his account of the species in 1932, there were records of 16 to 18 large Great Blue heronries in the files of the Bell Museum of Natural History. The majority of the colonies were located within the Eastern Broadleaf Forest and Laurentian Mixed Forest Provinces. They included heronries at several well-known nesting sites, such as Swan Lake in Nicollet County and Shields Lake in Rice County. Nesting records for the Shields Lake colony dated back to at least 1889 (Hanlon 1956). In addition to these large, well-known colonies, there were occasional reports of one or a few pairs nesting in trees along the edges of wetlands and lakes in western Minnesota, including the huge wetland complex at Heron Lake in Jackson County. At the time, however, breeding colonies (i.e., colonies in various stages of the nesting cycle) were documented in only 7 counties: Benton, Crow Wing, Hennepin, Murray, Nicollet, Polk, and Rice. Because of its proximity to the Twin Cities, one of the best-known colonies was one located on Crane Island in Lake Minnetonka. A mixed colony of Great Blue Herons and Double-crested Cormorants, the colony had been active on the island since at least 1876. But in 1907 the construction of several homes prompted the birds to move to a larger, nearby island that was undeveloped. Unfortunately their eventual abandonment of the site was inevitable, as the lake’s rising popularity led to a dramatic increase in shoreline development and recreational activity, including the construction of a Boy Scout camp where the birds were nesting (Roberts 1932). During the next 30 years, there were a few large colonies that were consistently visited and reported on by field biologists, bird clubs, and bird enthusiasts. These included a colony on the Rice Lake Refuge in Aitkin County (Bronoel 1951, 1958; Hofslund 1950, 1952), the Lake Koronis and Cold Spring colonies in Stearns County (Galati 1952, 1954, 1955; Partch 1990), and the Shields Lake colony in Rice County (Hanlon 1956; Rysgaard 1962). Three of the colonies were dominated by Great Blue Herons but also supported small numbers of Great Egrets and Double-crested Cormorants. When Green and Janssen published their updated account of the species in 1975, they reported that the heron was a breeding resident throughout the state. At the time, however, no nesting colonies were known from the southwestern counties, and the few located in the northwest were small in size. A few years later, Janssen (1987) reported that nesting had been confirmed in 53 of Minnesota’s 87 counties since 1970. All the counties were north and east of the southwestern corner of the state. He also noted that colony size decreased as one moved north toward the state’s more densely forested landscape. Several more comprehensive assessments of the species’ distribution and abundance began in the 1970s. First, both the Chippewa and Superior National Forests conducted forest-wide surveys of colonial waterbirds. Given that many of the colonies on these forests were small and in areas that were not very accessible, their work was a welcomed addition to knowledge of the species’ occurrence in these extensively forested landscapes. In 1976, 12 Great Blue Heron colonies were reported on the Chippewa National Forest (Mathisen and Richards 1978), and in 1979 and 1980, 15 and 14 colonies, respectively, were reported on the Superior National Forest (Siderits 1979, 1980). At the same time, the Minnesota Department of Natural Resources’ Nongame Wildlife Program issued a series of reports in an effort to assemble a comprehensive inventory of all colonial waterbird nesting sites in the state (Henderson 1977, 1978, 1984; Henderson and Hirsch 1980). The reports were not based on a systematic, statewide inventory but were a compilation of reports from field staff as well as information compiled from other resource agencies, colleges, universities, and published accounts. The results were a good representation of the distribution of many species, particularly herons and egrets. Using the data compiled by program staff, Guertin and Pfannmuller (1985) summarized the status of colonies that were active from 1981 to 1983. A total of 127 active Great Blue Heron colonies were reported, distributed across 46 counties. Thirty of the colonies occurred in the Arrowhead region of Cook, Lake, and St. Louis Counties; 78 of the colonies occurred in the northern forest region from Pine County west to Morrison County and north to Clearwater and Lake of the Woods Counties. Despite the large number of colonies in this region, the largest colonies, supporting the greatest number of nesting pairs, occurred farther south in the Eastern Broadleaf Forest and Prairie Parkland Provinces. Twenty-five of the 127 colonies were mixed-species colonies comprised primarily of Great Blue Herons, Double-crested Cormorants, Great Egrets, and Black-crowned Night-Herons. The majority of active colonies (75) supported from 1 to 50 Great Blue Heron nests, 2 colonies supported 500 to 1,000 nests, and only 1 colony numbered more than 1,000 nesting pairs. The latter was located on Long Lake in Kandiyohi County; in 1981 it supported 1,186 Great Blue Heron nests. Nearly 15 years later, Hertzel and Janssen (1998) compiled confirmed nesting reports for 244 species known to have nested in the state since 1970. The Great Blue Heron was confirmed nesting in 54 counties. The fewest reports were from southwestern Minnesota and the Red River valley. During the MNBBA, participants tallied 2,385 Great Blue Heron records in 34.1% (1,625/4,766) of the atlas blocks that were surveyed and in 39.4% (920/2,337) of the priority blocks. Breeding evidence was confirmed in 90 (1.9%) of the atlas blocks; 2 of these blocks, however, represent just 1 breeding locality (Egret Island on Pelican Lake in Grant County) (Figures 2 and 3; Table 1). The birds were reported in all 87 Minnesota counties and were confirmed breeding in 47 counties (1 block straddled Pennington and Marshall Counties). The list of breeding counties included 10 that were new to the list Hertzel and Janssen published in 1998: Benton, Blue Earth, Dodge, Jackson, Lyon, Mower, Pennington, Polk, Renville, and Steele. Although surveyors originally reported far more probable and possible records than reported here, the vast majority of those records were changed to observed unless there was documentation that supported other breeding evidence codes. Great Blue Herons can travel far from the breeding colony to their primary foraging territories. Collectively, several studies have reported the mean distance traveled is from 2.3 to 6.5 km; others have reported that the birds range within 30 km of the colony, although most birds remain within 3 km (Vennesland and Butler 2011; Custer and Galli 2002). As a result, unless birds are seen on the nest, other observations cannot reasonably be assumed to indicate possible or probable breeding status. Conducted approximately 30 years after the compilation prepared by Guertin and Pfannmuller in 1985, the MNBBA provides a reasonable data set to compare with the earlier data. MNBBA data suggest that the heron’s statewide distribution has changed very little. The number of nesting colonies, however, appears to have declined from the 127 reported in 1985 to the 90 confirmed MNBBA nesting reports. Data from the federal Breeding Bird Survey (BBS) also demonstrate a declining state population. Little has been written about broad-scale changes in the distribution of Great Blue Herons in the past 100 years beyond changes in abundance at individual colonies. Nearby states and provinces that have conducted two breeding bird atlases, such as Ohio (Rodewald et al. 2016), Michigan (Chartier et al. 2013), and Ontario (Cadman et al. 2007), have noted little change in distribution but a decline in overall numbers in Ontario and Michigan and an increase in Ohio. Breeding distribution of the Great Blue Heron in Minnesota based on the Breeding Bird Atlas (2009 – 2013). Summary statistics of observations by breeding status category for the Great Blue Heron in Minnesota based on all blocks (each 5 km x 5 km) surveyed during the Breeding Bird Atlas (2009-2013). Summary statistics for the Great Blue Heron observations by breeding status category for all blocks and priority blocks (each 5 km x 5 km) surveyed during the Minnesota Breeding Bird Atlas (2009-2013). With such a cosmopolitan distribution, it is no surprise that the Great Blue Heron is an adaptable species selecting a wide variety of nesting habitats. Nesting colonies are often located on islands in rivers or lakes (Figure 4), or in remote lowlands, especially in more extensively forested landscapes. A primary criterion for selecting a suitable colony site is its proximity to productive wetlands, shallow lakes, or shorelines for foraging. A colony’s location may also be driven by the presence of predators. Islands or remote wetlands that are more difficult for mammalian predators to reach are favored (Gibbs et al.1987; Vermeer 1969). Tall trees for nesting are preferred, but the birds occasionally nest in shrubs, on the ground, or even on artificial structures. When colonies are located in woodlands, the birds usually select the tallest trees within the canopy (Vennesland and Butler 2011). Many of the largest colonies in Minnesota are located on forested islands within rivers or lakes. Familiar sites include the Pig’s Eye heron rookery immediately south of downtown St. Paul, the Egret Island rookery on Pelican Lake in Grant County, and the Long Lake colony in Kandiyohi County. In the more extensively forested landscape of the Chippewa National Forest, the birds have been reported nesting in all cover types, from upland and lowland conifers to upland and lowland hardwoods. Many sites were on small impoundments, especially beaver ponds. Live trees supported only one-third of the nests; the remainder were in dead trees (Mathisen and Richards 1978). The history of a nesting colony in Itasca State Park over a period of three decades is typical of many colonies. Reports documented that the colony moved to different locations within the park on three occasions from 1940 to 1967. Disturbance was known to be the factor responsible for the first documented move from Elbow Lake to Radisson Lake; the eventual degradation of dying nest trees was believed responsible for subsequent moves (Fahey 1968). The heron’s acidic excrement stresses trees, and their use of the outer limbs of the upper canopy can physically damage the trees (Kerns and Howe 1967). Other threats to the colony’s trees include wind and, more recently, Dutch elm disease. In Minnesota, the American Elm was often a preferred nesting tree, particularly in central and southern Minnesota (Hanlon 1956; Partch 1990; Adams et al. 1973). Nevertheless, dead and dying trees often are preferred as nest sites until they fall or become so degraded they can no longer support the weight of the birds and their nests (Carlson 1995). Typical breeding habitat of the Great Blue Heron in Minnesota (© Lee A. Pfannmuller). The North American Waterbird Conservation Plan estimated the continental breeding population of Great Blue Herons in North America was 83,000 breeding adults (Kushlan et al. 2002; Vennesland and Butler 2011). Approximately 18% of the breeding population occurs in the Great Lakes; nearly 40% occurs in just two states: Louisiana and Texas (Spendelow and Patton 1988). Although the heron’s population estimate seems low, the species is sparsely distributed across its range. Populations plummeted in the late 1800s and early 1900s due to persecution and hunting for the plume trade. Today the Great Blue Heron has reoccupied much of its former range but likely at smaller population levels than in the past (Vennesland and Butler 2011). Within the Great Lakes region, central Minnesota supports relatively high densities of breeding birds (Figure 1). No statewide population estimate is available, but efforts to monitor Double-crested Cormorant and American White Pelican colonies in the state provide some insight into the heron’s abundance. From 2004 to 2015, cormorant and pelican colonies were censused three times by Cuthbert and her colleagues at the University of Minnesota (Hamilton and Cuthbert 2016). Great Blue Herons frequently nest in single-species colonies, but they also nest in association with cormorants. From 2004 to 2015, 18 to 21 cormorant colonies were surveyed that also supported Great Blue Heron nesting populations (Table 2). The vast majority of sites were in central and southern Minnesota where the largest mixed-species colonies are located. These sites also supported the largest nesting populations of Great Blue Herons in the 1970s and 1980s. The total number of heron nests in this region of the state ranged between 1,258 and 1,741 during the recent surveys. Although this likely represents only a portion of the statewide breeding population, these are the only Minnesota Great Blue Heron colonies that have been systematically monitored in recent years. Across the BBS region, populations demonstrated a slow but significant increase at a rate of 0.44% per year from 1966 to 2015 (Sauer et al. 2017). The heron’s relatively low abundance, however, means the data have some limitations. 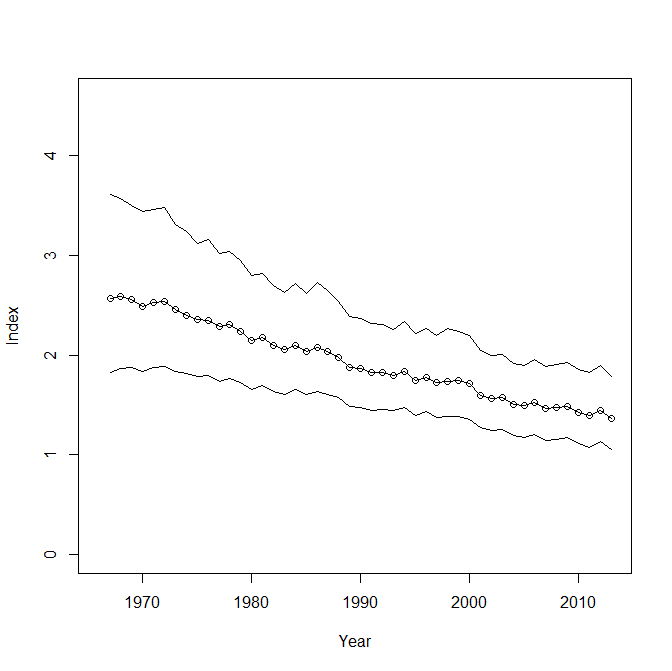 In Minnesota, the heron is abundant enough to generate a robust population trend line; it has demonstrated a significant and steady decline, averaging 1.32% per year since 1967 (Figure 5). Assessing population trends for species that are so strongly colonial is challenging, and some biologists put little faith in trends derived from the BBS and Christmas Bird Counts (Vennesland and Butler 2011). Nevertheless, 40 years of BBS data that point to a steady decline in Minnesota suggest that observers are consistently reporting fewer birds. Several factors may be contributing to the observed decline. Because American Elms were a preferred nest tree in many Minnesota colonies in the southern and central regions of the state, the devastating impact of Dutch elm disease likely impacted these nesting colonies. Warner (1985), for example, documented the decline in Great Blue Herons nesting at the Pig’s Eye Island rookery in response to the nearly complete loss of elms on the island. Increasing levels of recreational activity and predator disturbance also may be factors limiting reproductive success. One Minnesota study clearly demonstrated the impact that a local population of raccoons, as well as Great Horned Owls and American Crows, can have on a colony of Great Blue Herons (Von Duyke 2006). Human disturbance also has been linked to colony abandonment and lower reproductive success (Vennesland and Butler 2011). Biologists in Ontario speculated that declines may be related to a decrease in an important food item, amphibians (Cadman et al. 2007). They noted a study conducted in the Great Lakes that pointed to a decrease in many amphibian populations, such as the Green Frog (Crewe et al. 2005). Finally, in a state that has witnessed a significant loss in the quality and quantity of wetlands, the availability of suitable wetlands for foraging also may be contributing to the species’ decline in Minnesota. Great Blue Heron nest counts at mixed-species colonies with Double-crested Cormorants (Hamilton and Cuthbert 2016). Breeding population trend for the Great Blue Heron in Minnesota for 1967–2015 based on the federal Breeding Bird Survey (Sauer et al. 2017). The Great Blue Heron has been assigned a relatively low Continental Concern Score of 8/20 and is not considered a species at risk (Kushlan et al. 2002; Partners in Flight 2017). The species’ vulnerability to climate change is also considered low (North American Bird Conservation Initiative 2010). The biggest concerns for the future of the species are the protection of wetlands and the availability of secure nesting sites. General recommendations for management focus on protecting known colony sites and foraging areas (Vennesland and Butler 2011). From the 1950s through the early 1980s, there was great interest by local birders, colleges and universities, and state and federal resource agencies in locating and monitoring Minnesota’s colonial waterbirds, with a particular emphasis on Great Blue Heron colonies. The Minnesota Department of Natural Resources even solicited two studies to examine the most effective monitoring approaches (Green 1985; McKearnan 1997). Unfortunately, with a plethora of competing priorities for species in more dire straits, most of the monitoring efforts of the past have been discontinued. Data collected incidentally as part of the monitoring underway on Double-crested Cormorant and American White Pelican colonies are the only periodic monitoring data currently available. In the future, periodically monitoring the largest and most significant Great Blue Heron colonies is warranted to help insure that “one of the largest, most stately, and picturesque of Minnesota birds” remains a familiar sight (Roberts 1932). Bronoel, Joel K. 1951. “Cormorant-Great Blue Heron Rookery.” Flicker 23: 58–59. Bronoel, Joel K. 1958. “The Rice Lake Heronry.” Flicker 30: 37. Carlson, Becky A. 1995. “Nest Site Characteristics of Great Blue Herons (Ardea herodias) in Northeast Ohio.” Ohio Journal of Science 95: 312–315. Crewe, Tara L., Steven T. A. Timmermans, and Kathy E. Jones. 2005. The Marsh Monitoring Program Annual Report, 1995–2003: Annual Indices and Trends in Bird Abundance and Amphibian Occurrence in the Great Lakes Basin. Port Rowan, Ontario: Bird Studies Canada. Custer, Christine M., and Joan Galli. 2002. “Feeding Habitat Selection by Great Blue Herons and Great Egrets Nesting in East Central Minnesota.” Waterbirds 25: 115–124. Fahey, Patricia L. 1968. “Great Blue Herons.” Loon 40: 37–40. Galati, Robert. 1952. “Living with Great Blue Herons.” Flicker 24: 131. Galati, Robert. 1954. “Heron Rookery on Lake Koronis.” Flicker 26: 41. Galati, Robert. 1955. “‘Sportsmen’ Slaughter the Great Blue Herons.” Flicker 27: 175. Gibbs, James P., Susan Woodward, Malcolm L. Hunter, and Alan E. Huthchinson. 1987. “Determinants of Great Blue Heron Colony Distribution in Coastal Maine.” Auk 104: 38–47. Hanlon, Robert W. 1956. “Heron Island – General Shields Lake.” Flicker 28: 130–132. Hofslund, Pershing B. 1950. “Cormorant-Great Blue Heron Rookery.” Flicker 22: 128. Hofslund, Pershing B. 1952. “The 1952 Census of Tom’s Island.” Flicker 24: 163–164. Kerns, J. M., and J. F. Howe. 1967. “Factors Determining Great Blue Heron Rookery Movement.” Journal of the Minnesota Academy of Science 34: 80–83. Mathisen, John, and Ann Richards. 1978. “Status of Great Blue Herons on the Chippewa National Forest.” Loon 50: 104–106. Rysgaard, George N. 1962. “Storm Damage to a Heron Rookery.” Flicker 34: 78–80. Siderits, Karl. 1979. “Eagle Osprey, Heron Nesting Report – 1979.” Loon 51: 203–205. Siderits, Karl. 1980. “1980 Bald Eagle, Osprey and Blue Heron Nesting, Superior National Forest.” Loon 52: 193. Spendelow, Jeffrey A., and Stephen R. Patton. 1988. National Atlas of Coastal Waterbird Colonies in the Contiguous United States: 1976–1982. Biological Report 88(5). Washington, DC: U.S. Department of the Interior, Fish and Wildlife Service. Vermeer, Kees. 1969. “Great Blue Heron Colonies in Alberta.” Canadian Field-Naturalist 83: 237–242.